The publishing industry is not particularly kind to short story writers. The magazine market for short fiction is not as it once was, and the economics of books sales strongly favor the novel. This means that even those writers with an affinity for short fiction don’t often invest their time in mastering the form, at least not in the way that writers of earlier generations did. Though THE VIRGINITY OF FAMOUS MEN is only her second story collection (in addition to two novels), Christine Sneed has worked for years to hone her skills as one of America’s finest practitioners of the medium. By the time her first book, Portraits of a Few of the People I’ve Made Cry, appeared in 2010, Sneed had already written a hundred short stories. Those hours of work are apparent on every page of the new collection, where Sneed’s craftsmanship and control mark her as something truly special in the current literary landscape. 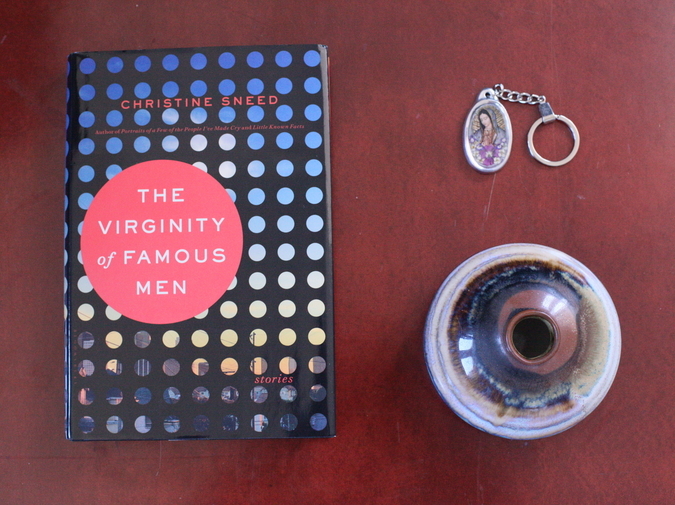 THE VIRGINITY OF FAMOUS MEN was released laster September by Bloomsbury. Sneed was kind enough to answer a few of my questions via email regarding her process, her influences, and how she sometimes writes a story out from the title. I was wondering how you would describe your relationship to short fiction. Your first book was a story collection, Portraits of a Few People I’ve Made Cry. You’ve since published two novels, and now you’ve put out another collection with THE VIRGINITY OF FAMOUS MEN. Do you have a preferred form? Short stories are my first love when it comes to fiction. There’s often a freshness or sense of play to them that I think can be harder to achieve in novels. They also require, to some extent, compression of the narrative arc, but the best story writers can achieve this without reducing the story’s complexity. I think of Alice Munro and Mavis Gallant, or Edward P. Jones and William Trevor, and am in awe of what they have achieved in their short stories. Do you think the short story is more suited than the novel to telling a specific kind of narrative? Obviously the different forms have different strengths and objectives, but do you think certain situations lend themselves to short fiction? I noticed in this new book how many of the stories are about compromised romantic relationships. And they struck me as relationships that maybe wouldn’t benefit from a novel-length investigation, but are nevertheless engrossing and worth exploring for 20 or 25 pages. With the novels I’ve written, I do approach the complexities of the main characters’ romantic relationship(s) as the basis of one of several different plot threads I’m working with, which ideally provide readers with more access to the characters’ inner lives. Romantic relationships serve the same function in the short stories I’ve written, but I suppose it’s true — because this is a much shorter form, making romantic problems the source of a short story’s primary conflicts doesn’t seem to me to be too thin of a construct. Yet, at the same time, I want the characters’ behavior in their private lives to inform and complicate how they approach their less intimate relationships too. A number of these stories are centered around people who work in Hollywood. The title story and “The First Wife” both feature very famous actors, and “The Prettiest Girl” follows a film location scout. What is it about cinema that makes it an attractive industry for your characters? I’ve been interested in the culture and myths promulgated by Hollywood since I was a child and started going to the movies with my parents. As I’ve gotten older, I’ve been more interested in how the media portrays famous people, how simultaneously it celebrates and denigrates them — when you’re winning awards, marrying the prince or princess, etc., you’re the best thing around, but God forbid you show any signs of weakness — superficial (wardrobe, hairstyle) or otherwise (drug addiction, adultery) — because guess what, you’re what’s for dinner. Is it more difficult to create a fictional celebrity than it is to create a fictional Joe Schmo? The conceit of the title story, for example, is that Renn Ivins is someone we’ve all heard of, and would recognize on sight, which isn’t the case for characters in most other stories. Is that a trickier verisimilitude to achieve? I don’t know if it’s any harder for me to write a famous character than a non-famous one. I think I begin with the same kind of curiosity in both cases: I want to figure out who this person is, and fame is just another characterizing tool, really. It has demands similar to other qualities — you have to find a way to make a celebrity seem authentic, just as you would if you were writing about a character who teaches kindergarten in Cleveland or telecommutes from Denver to a job in Silicon Valley. What about verisimilitude in the stories with more outlandish scenarios: “Roger Weber Would Like To Stay,” which features a woman involved in a flirtatious relationship with a ghost, or “Whatshisname,” about a man who has suffered a brain trauma, then wins the lottery and wants to start his own orphanage? These stories are funny, and the humor comes in part from the cartoonishness of the situations. How do you strike the balance between creating authentic characters and yet allowing them to be “big” enough to generate the desired comic effect? Well, I’m not really sure! I think I try to write these characters in a way that both humanizes them but also celebrates the absurdity — whether it’s intended, or not — of the situations I’ve placed them in. Everyday life is pretty absurd in some ways — all the things, for one, that we can’t say to each other but want to, i.e. how we really feel about our jobs or our coworkers or our family members, or the things we want out of our jobs and personal relationships, etc., but are afraid to ask for, or else we do ask for, knowing, more or less, that we’re making reasonable demands, but we’re not sure how others will feel about them. I guess I try to put my characters “out there,” which I feel is a big part of being able to find happiness or contentment, whatever that might mean for them (or us). I think one of the things a short story can do better than almost any other medium is to explore a very specific situation in a nuanced way. Like “Clear Conscience,” for example, is about a divorced man whose sister-in-law stars to make pretty serious advances on him, while she’s still married to his brother. And that’s maybe not an everyday situation, for all of us, but it’s certainly one that must happen all the time, around the world. And I think that, in the future, if I hear about a situation like that, I’ll think of your story. It becomes a point of reference, and example of how that situation worked out, at least in one instance. Do you come up with situation first and then develop characters to fit them, or do you start with a character and see what interesting scenario you can build around them? The characters almost always come first, and slowly their situation comes to light. I knew at the beginning, however, of “Clear Conscience” that there’d be some sibling rivalry between Michael and his brother Jim, especially in regard to Jim’s wife Sasha, but I really wasn’t sure how I’d work with this idea and how it would resolve itself. I suppose I often have a vague idea of subject when I conceive of a character, and in this case, I also had the title before I started writing, so I knew that the idea of having a clear conscience would guide some of the decisions I had the characters make, especially Michael. Do you often come up with your titles before you write the story? I noticed on the book’s Publication Information page it says: “The Virginity of Famous Men” appeared in the Southern Review as “Café de Flore.” An earlier story titled “The Virginity of Famous Men” was published in Cream City Review. That title, then, migrated to a different story. I wrote two stories, one titled “The Virginity of Famous Men” and the other “The Virginity of Famous Women” — the former about 13 years ago, and the latter about 9 years ago. I was originally planning to title this collection The Virginity of Famous Women, but decided I preferred the title The Virginity of Famous Men — the “Women” story was more like an essay, and I also wanted to write a new story with the title “The Virginity of Famous Men” because the original story was likewise closer to an essay than to fiction. I thought too that it might work as a title for a (very brief) sequel to my second book, Little Known Facts. I wrote the new “Virginity of Famous Men” to show what the main characters were doing 18 months after that novel ended, but needed to title it something else, hence “Café de Flore,” when it was published in the Southern Review in order to avoid repeating this title in two different literary journals. I recently finished a new novel that’s about money, family, and personal morality. I’m fine-tuning it a little, while also working on a couple of short stories. I keep thinking about revising an essay about a few writers I admire that I wrote a couple of years ago but haven’t yet found the motivation to do this. Who are the writers in the essay? Or, if you don’t want to give that away yet, who are some other writers you admire? I noticed that in your email signature you list the books that you’re reading or have recently read, which is very cool. It’s actually an essay about male writers who have influenced me and a meditation on my relationship with my father (who is my stepfather, though he’s been with my mom and me since I was 3) — Stu Dybek, Scott Spencer, Updike, and Jim Harrison. One or two people I showed it to wanted more Dad-related stuff, and I’m kind of balking. He’s very private, so I’m not sure how to proceed. Glad you like my signature — I do try to support other writers…it’s such a hard business, as you know. My most recent obsession is Rachel Cusk’s work. I LOVE her books — I have read most of them now. And Alice Munro, William Trevor, Deborah Eisenberg, Edward P. Jones — I love their work too. And W.G. Sebald. I’ll have to read some Edward P. Jones. He’s been mentioned by a couple of the short story writers that I’ve interviewed, and I’ve never actually read him. I loved All Aunt Hagar’s Children — such a moving and intricate collection; Lost in the City was his first book; I admired it, too, but AAHC was my favorite of the two. I went to college in D.C., too, and so the settings of Jones’s stories, which are mostly in that city, resonated with me too. Do you have any advice for writers at the beginning of their career? Is there anything you would have done differently? I don’t know if I’d have done anything differently — I don’t think so? I didn’t have the right agent initially, though, and sat around for seven years thinking something might sell, but the two or three manuscripts of mine that she tried to sell didn’t go anywhere (there’s a much longer story here — I was initially taken on by a different agent at the same agency, but she was promptly let go after I signed a contract and I was assigned to another agent there — not ideal). During those seven years of stasis, however, I was writing work that ended up in my first book, Portraits of a Few of the People I’ve Made Cry, and I think I was getting better as a writer. That book got published because I won AWP's Grace Paley Prize — no agent required — and it helped me find a new agent who then sold my next three books. As for advice, I think everyone has heard this a lot but it’s still true — read with curiosity and hunger — reading is as important as writing, more important, probably, when you’re first starting to write.